Walk to Surf Spots! Come and enjoy your Mexican Vacation at our contemporary, beachfront home with infinity pool and spa/hot tub. Villa Cascada is located in a quaint private gated community on the Sandy Beach of Bahia de Banderas, between Punta Mita and La Cruz de Huanacaxtle, and is walking distance to some of the most consistent surf breaks in the area. It offers stunning view of the Sierra Madre and ocean, and in the winter, you can watch whales from the pool and spa/hot tub! Daily maid service and cook (for breakfast) is included. Additional meals can be easily arranged for a small fee per diner. Concierge service is available to arrange local activities or special meals and will do grocery shopping in advance of your arrival. Our FABULOUS staff have been with us for many years and they are happy to assist you with your needs during your stay to ensure you have a fantastic vacation at our villa! Located only 7 minutes from Punta Mita and 40 minutes from the Puerto Vallarta airport. Wonderful local towns with great restaurants within 5-15 minute drive! We look forward to hosting you at our Mexican Home! Daily housekeeping and cook's services included. Concierge service available upon request. This is our 12th year staying at this amazing home! Words can not describe how wonderful this place is! Thank you so much again for a wonderful stay! This is our 9th year in a row to return. The house is perfect for 3 couples as each bedroom is a Master with bath. The house, pool, beach, views are all unbelievable. Where else can you sip cocktails in the pool while you watch whales jump out of the ocean. But what really makes the place special is the SERVICE. The staff cooks each meal and serves you like a rock star. We will be back for year 10! The property was spacious and beautiful, with a wonderful cook on hand. I would highly recommend to anyone! This house is beautiful, the views and beach are fantastic! My family and I had a wonderful time at this property. The layout of house is perfect with 3 master bedrooms with their own baths, no shared walls which make each room very private. The pool is lovely, only complaint was pool and jacuzzi was not heated, there has been a shortage of propane, unfortunately this made it unable to use at night. The staff at house is wonderful! Mode and Freddy made everything so comfortable for us, breakfast every morning, we also had dinner prepared 2 evenings while we were there, delicious! The town of Punt Mita is a short 10 minute drive, with plenty of great restaurants for dining. Loved being able to walk out the door to the private beach. Highly recommend! Great spot. We had a wonderful experience staying in villa cascada. Relaxed and wonderful. Would highly recommend! Villa Cascada was the perfect vacation for our small group of friends. The service provided by the staff of the house, Freddy and Mode was incredible. Mode prepared breakfast, snacks and dinner daily including delicious fresh fruit, huevos rancheros, fish, carnitas, fajitas and the best/freshest guacamole and salsa. The house is located within a small private and gated community about 45 minutes from the Puerto Vallarta Airport where you feel very safe and at home. Miguel, the concierge of the house coordinated our airport transfers and groceries before our arrival. Although his responses were often delayed before our check in, he was quick to respond during our stay. The highlights of the house: infinity pool, beachfront location with easy access to beach, private (while neighbors are on each side of house, no one occupied the homes during our stay), the bedrooms are spread out nicely that even with a group of friends you have a lot of privacy, the house is a 5 minute drive to the W Hotel if you're interested in drinks, dinner, dancing outside of the house. Suggestion for home improvements: the pool chairs were very uncomfortable and 1 was broken. While insects are common in Mexico, the master bathroom sink had a major ant problem. The house had boogie boards to use in the ocean, if the owners invested in 1 or 2 standup paddle boards they would be an amazing addition to the home. Overall, an amazing experience! 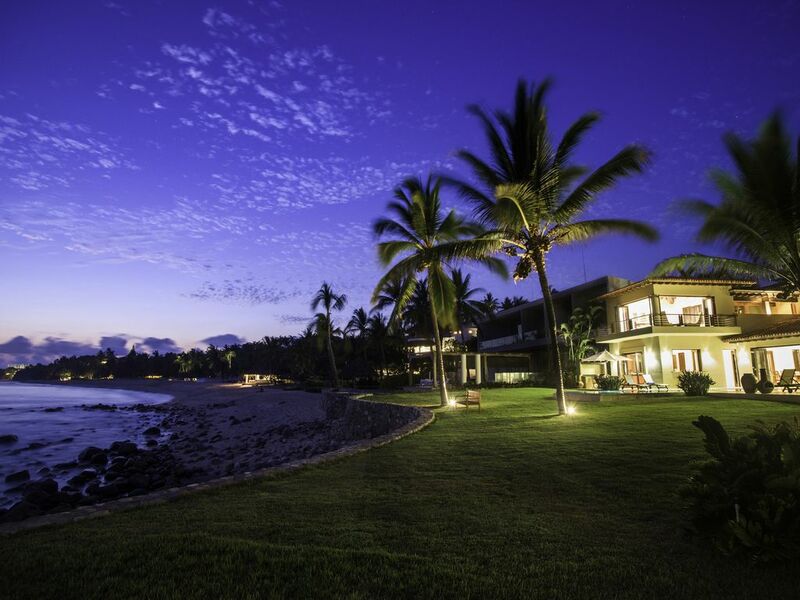 We will definitely return to Villa Cascada and will recommend to anyone looking for a quiet retreat in Punta Mita. Thank you!